Vegas on New Years Eve is EPIC. New Years Eve at Off The Strip is magical! Join us in December 31st for a pre-set dinner menu with an available wine pairing. 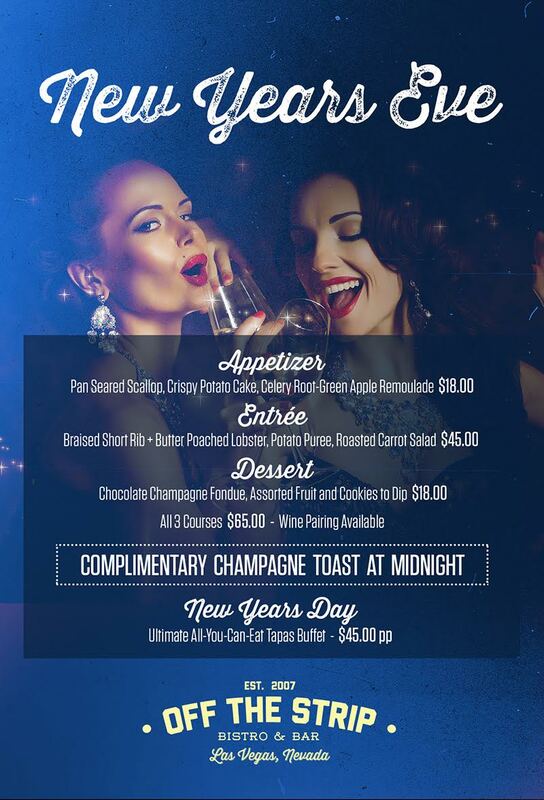 Eat delicious food, sip on fantastic wine, and enjoy a complimentary champagne toast at midnight to ring in the new year. Don’t worry about your plans any longer, this is an offer unlike any other. Once you’ve recovered (or even if you haven’t) from New Years Eve, you can join is on New Years day for an all-you-can-eat tapas buffet for only $45! Are there better deals out there? Definitely not! This is the hottest destination for all things associated with New Years.